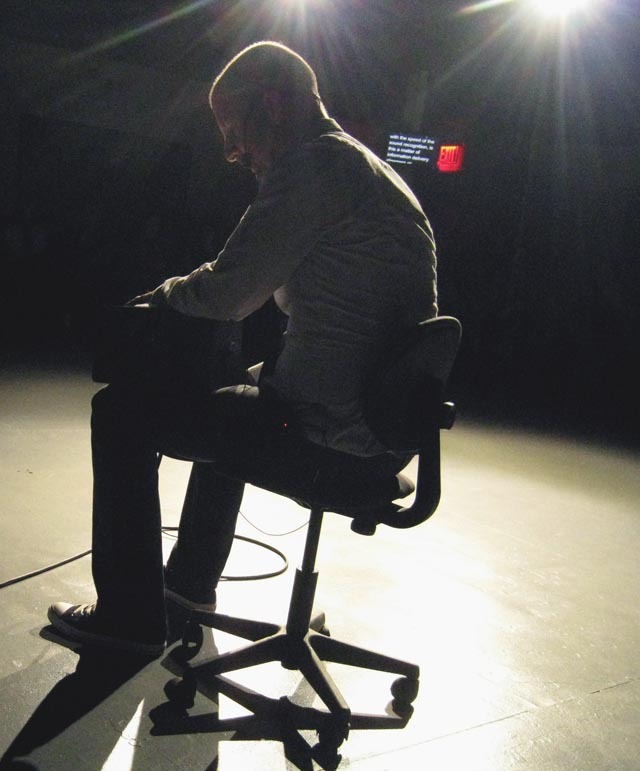 Joe Diebes, a composer and creator of “performance environments” showcased his latest piece BOTCH, part of his three-year artist residency at Manhattan’s HERE Arts Center. BOTCH builds upon a history of avant-garde composition, theory, practice, and philosophy to incorporate the currently raging non-tangible extravaganza referred to as “machine learning.” Performers became units enacting sound functions, until that function was depleted and then switched to another sound function to mimic algorithms, or sets of instructions. They did this through gestures meant to mimic the use of Wii controllers and other electronic devices. Functions nested into the genre of process have infiltrated the creative world since the early 20th century. What is unique is how Diebes ties together overlapping threads outputting them in a vitally cracked form. This includes the entire genre of Fluxus event scores, the breakdown of language via repetition as highlighted in Phillip Glass and Robert Wilson’s “Knee Play 5” in “Einstein On the Beach,” mismatched network communications enacted by Lilly Tomlin as Ernestine the telephone operator, and the haunting scores of Pamela Z. He also throws in Meredith Monk’s exploration of guttural utterances as instinctive universal communication and music. Within this overarching context he posits questions — how does information come to us subliminally though a surfeit of information? How do fragments of audio and visual detritus influence our reality? How does a composer make sense of it all? The stage for BOTCH was spare: chairs, blackboards, dice, tape, portable speakers, microphones, headsets, and lights. The performers dressed in black, white, and grey. BOTCH delves into the origin of language by using guttural utterances and reconstructed vowels, and through throttling out hyper-punctuated consonants. The emphasis was on a primordial pre-cognition of speech. A metronome kept time as a tick took one phrase and a tock tossed it out like a viral meme. Scene changes were decided through the roll of oversized dice. Words on screens flash overhead punctuated by cacophonies of urbanized pre-recorded sounds. Finally, the house light dimmed and both actors and audience was left in the dark, with no technology, no electricity, their voices eerily silenced. 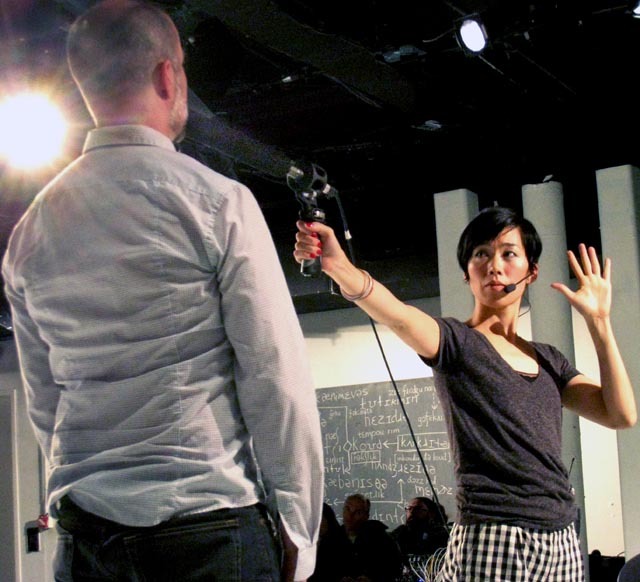 BOTCH by Joe Diebes in collaboration with/performed by Christina Campanella, Michael Chinworth, John Rose and Saori Tsukada played from November 12–23 at HERE (145 Sixth Avenue, Soho, Manhattan).